LetsGoPens.com • View topic - Mario's TV coming back? It was a cool thing at Mellon when NBC didn't mess it up. And with Mellon gone and trees now planted where the screen was last year, does the screen even go up for this year? Re: Mario's TV coming back? FreeCandy44 wrote: It was a cool thing at Mellon when NBC didn't mess it up. And with Mellon gone and trees now planted where the screen was last year, does the screen even go up for this year? I could see them putting it in a lot across from CEC. The problem of where it was last year, it started to tie up traffic. Yeah I know it wasn't as nice as it was back when they had it in the grass outside of Mellon, but the lot they had it for the Lightning series in 2011 was a much better location than last year's, IMO. I personally hope whenever the Igloo's old spot is re-developed that a permanent area is made for this kind of thing. They could put it down at PNC Park. Nothing exciting happening down there lately. FreeCandy44 wrote: They could put it down at PNC Park. Nothing exciting happening down there lately. They should just demolish some low income housing on the hill and make a spot there. Idoit40fans wrote: They should just demolish some low income housing on the hill and make a spot there. The spot they have it now on the CEC grass just is ok. That is a nice spot to hang if your 15-22 yrs old. no name wrote: The spot they have it now on the CEC grass just is ok. That is a nice spot to hang if your 15-22 yrs old. Didn't they plant trees there? Then at this time of year its a nice place for males aged 23-40 to hang out. They take them out for the playoffs. Thats bad treatment of trees. The Penguins are a horrible organization. Always hated this, still do. - Do not do this for home games. Parking and traffic are already tight without adding several thousand more people to the area around CEC. - For away games, open up the arena and have small admisssion charge that goes to charity. The video and sound inside CEC is so much better, there are comfortable seats, and no issues with rain or cold. 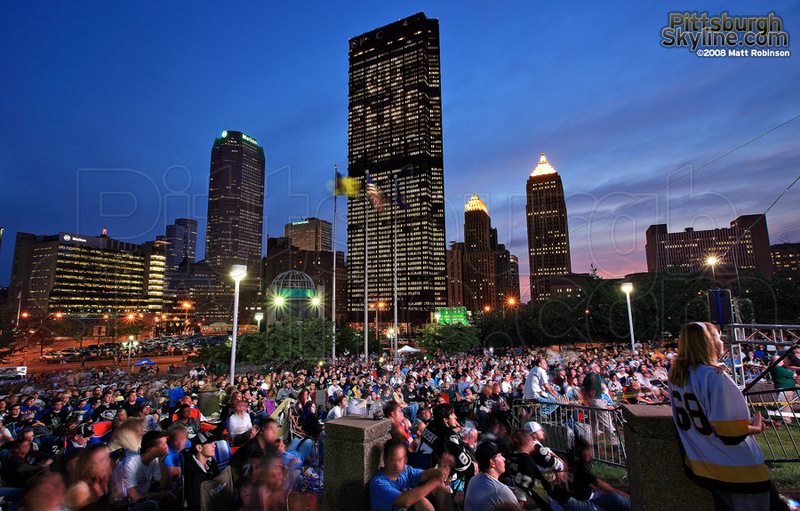 Or, as some else mentioned, set it up at the parking lots by PNC Park or Heinz Field. If you are not inside the arena, does it really matter if you are sitting just outside the game or in another part of town? It is just a gathering of fans to watch the game and could be held anywhere. Love this idea, if they would just open the lower bowl and have the concession stands open they would make a killing. No worries about the weather It wouldn't be unrealistic that they could get 3000 fans in there for that. I would take my kids to watch a game for something controled like this. I fear losing my kids in that crowd the way it is now. DocEmrick wrote: Always hated this, still do. Why would someone "hate" this? Oh wait, its you. Never mind. There are a lot of costs to operating the arena though, not to mention other events there on Penguins off-days. PhantomJB93 wrote: I personally hope whenever the Igloo's old spot is re-developed that a permanent area is made for this kind of thing. I was down in Dallas a few years ago when they were playing the Wings in the Western conference final, and went to a game, and whether it was permanent or not, the area outside of the arena where the bars, etc were had a giant TV showing the game. It was pretty cool. Like you said, hopefully when they develop the old arena area, maybe they will have something like this. Yeah, don't understand statements like this. Let people enjoy themselves. If a TV outside creates a good fan atmosphere then I'm all for it. Just harmless fun. I've not made it down to experience this yet but would definitely like to. Hope they figure out something good for it. Fire0nice228 wrote: I've not made it down to experience this yet but would definitely like to. Hope they figure out something good for it. I wouldnt waste your time. I went in I think it was 2008. Too many annoying idiot kids looking for attention. Get off my lawn. Doc doesn't like the TV because it emits radio transmissions that interfere with his ability to speak telepathicly with aliens. so very cool! I went in 2010, cold night against ottawa. and in 09, warm saturday against the canes. It was amazing to watch the big screen highlights, see the crowds gather. I get the idea of not wanting to have it for home games because of the traffic nightmare and other factors...but I must say, I got the chance to go to a finals game in '09...walking up to Mellon with all those people there and all the activity and noise going on - people on the lawn talking to people going in the gates telling them to be loud, etc...it was a pretty surreal feeling.